An ingenious and fascinating woman, Lesley Gracie has lead the Hendrick’s ship since its maiden voyage, crafting the recipe for the gin in 1999. The Yorkshire-born distiller has one of the finest noses around (she sits on the ISC judging panel and leads the New Liquid Development team at William Grant, the family-run company that owns Hendrick’s) but it’s her gift for innovation and astounding knowledge that’s catapulted her to iconic status in the spirits industry. Her fascination with botanical flavours started young, when (aged 4) she began serving her family teas brewed from plants and twigs - which eventually lead to a degree in Chemistry. Lesley moved to Scotland from Yorkshire to join the company in 1988 where she’s worked in the Technical Team for 31 years. Interestingly, she never made the conscious decision to be a distiller, prior to joining William Grant she’d worked with flavours so when she joined the team she was given new liquid development as part of her remit - which then developed into her main role. And then the opportunity to develop a new gin arose from the then Company Chairman - an astute man who had very specific ideas about the flavour profile he wanted; Britishness. Lesley and William Grant’s Malt Master settled on eating cucumber sandwiches in British gardens as the profile and of course rose to the occasion (pardon the pun), engineering the winning recipe with 11 botanicals and additional essence of cucumber and rose after 21 trial distillations. This unique flavour combination and distinctively smooth liquid took the gin world by storm, but it was also unusual in its production. Hendrick’s is made by blending spirits from two different stills which produce noticeably different styles of gin due to their different constructions, the amount of copper contact and methods of distillation; a Carter-Head still (which produces a spirit heavy with juniper) and a small Bennett pot still (which in contrast produces a lighter, floral forward slightly sweet spirit). 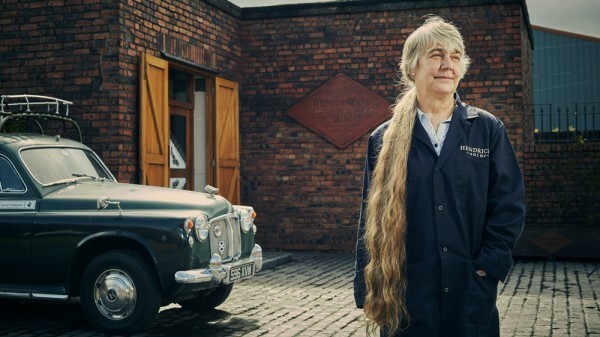 And to this day, Lesley still distills every drop of Hendrick’s herself. She is one of four people who know the exact recipe. She distills the liquid in small batches, 500L at a time - so that she can control production and ensure that every bottle of her juniper baby is up to par.